It’s been almost a year since I have posted to this blog. It’s not that we have quit working on our startup business idea. We’ve been working but perhaps not all that effectively. I recently realized that I have been stuck “thinking big” and “acting big” and losing valuable time in the process. I read a lot of books and blogs for startups and entrepreneurs as well as business “self-help” books by the likes of Donald Trump that pedal the idea of “thinking big.” I became a slave to this idea of not selling myself short and tried to apply this notion to our business, Stylomate. The result? Two-and-a-half years after conceiving the idea, all we have to show for our product is a rarely updated blog, bits and pieces of our prototype software, and some sample logo and business card designs that we will sell—eventually. What we do have is, perhaps, the most thorough business plan and financial model that money can buy. 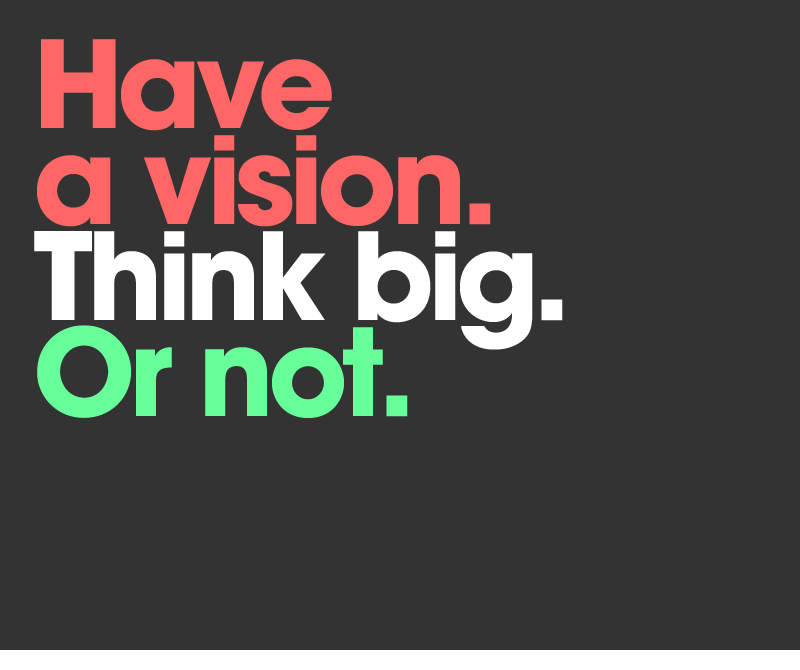 The idea of “thinking big” led me to believe that we needed to go the way of seeking funding for our big idea before we actually had anything built. In order to do so, we needed to have a killer business plan and financial model to back it up. So I spent nearly two years of my free time meticulously researching and writing all aspects of our business plan as well as modeling our idea in Excel, paying scant attention to actually building our product. In the process, not only have I not built our company or business idea, but I have also missed out on quality time with my wife, children and friends. How did this happen and why did I allow myself to lose such valuable time? The answer is probably something akin to what Justin Vincent calls “entreporn.” In a nutshell, the idea is that we are sold the “startup myth,” which entails coming up with a big idea, financing the idea with several rounds of venture capital and cashing out either by going public or being acquired by a larger company. We forget to just do something we like, help people and be happy. The startup myth is perpetuated every time we hear stories in the news similar to Facebook’s recent billion dollar purchase of Instagram or Zygna’s $200 million acquisition of OMGPOP, the maker of the wildly popular “Draw Something” app. Vincent argues that this myth causes many of us to waste time on ideas and a business funding process that likely won’t work and that will waste us invaluable time. He thinks that if we aim to create a “lifestyle” business instead—making $10,000 a month or even $100,000 a month—not only are we much more likely to succeed but we’ll be happier in the process. That is, if we aim more modestly, we are much likelier both to achieve financial independence and to find satisfaction in our work. It’s an aim he thinks many of us can achieve, especially in a Internet-driven economy. One thing I discovered is that the startup myth works for those that have already achieved entrepreneurial success or have ample industry contacts and experience in the business venture they are pursuing. If you have already built a successful business or simply are a rockstar professional, it’s much easier to getting funding from investors to launch your new business. The problem is that most of us don’t fit this mold. While I have had some success as a professional designer, I realized that I didn’t have sufficient experience in the activity that our business will perform or an entrepreneurial history of success. Without either of these, aiming for big-time funding is a sucker’s bet. So I recently decided to start “acting small.” Sure, I still “think big” and believe that given our target market our business has the potential to grow into a multimillion dollar affair. But I am much more focused on taking steps to make the business “real” and selling something as soon as possible. I realized that my minimum viable product—the one that gets my customers sufficient features to make my product sellable while simultaneously giving me the maximum amount of constructive feedback from the same customers—is not the automated app that we have envisioned. Based on that realization, we will soon be offering a manual version of our idea of selling high quality logotypes and business cards based on premium typefaces (fonts). How did I get out of this funk? Some of my friends who are successful in busines challenged me to be more practical. One asked, why I was building an app to automate the logo and business card design and purchase process when I wasn’t already selling logos to begin with? Why not just start selling logos, he wondered. Another told me I had to be much more street smart—as opposed to Excel smart—and get something going now. Once I read Vincent’s article on Entreporn, I realized that I have been fantisizing about creating a startup worthy of Silicon Valley rather than to actually building a viable small business. The use of “Software as a Service” (SaaS) platforms has grown tremendously over the past several years. Companies such as Netsuite, which offers online accounting software and Freshbooks, which offers a Web-based time-tracking and invoicing software, are both examples of this approach. Clients always get the last version of the software, without having to upgrade the application (and all the headaches that entails). Software can be accessed from anywhere and using different devices like laptops and mobile phones since it’s “in the cloud,” that is, on the Web. Customers data is stored in the application, and so there is no need to worry about backing up vital data. The business that provides the software makes a regular income that can be invested into improving the service. So SaaS offers some definite advantages to traditional “software-as-a-product” approaches. But there are some important drawbacks that should also be considered when you are evaluating software services or products. In particular, the more time you invest gathering and storing the data in an SaaS application, the more careful you should be about tying yourself to the application. What would happen if the firm that behind the SaaS platform you’ve been using in the last five years enters into bankruptcy? Will you be able to get all your data and continue using it? Can you export your data at any time? Usually you can export some of the data in SaaS platforms to popular formats such as Excel tables. Sometimes, though, data is lost in the export process. After all, if you could keep the information in a Excel table to begin with you wouldn’t be using using the SaaS application to begin with! Also, many SaaS platforms allow other applications to connect to the SaaS platform via the application programming interface (API) and thus extract and use data. However, often times there are many details that cannot be exported. This begs another question. Let’s say you find a different online SaaS application and you decide that you want to switch to that provider and take your data with you. Can you export all your data, with all the details, and import it into another SaaS platform that may be better and cheaper? Do you think your data is safe in the cloud? The T-Mobile’s Sidekick users thought that too, and all their data got lost. The only backup you should firmly trust is the backup you make and keep. Most SaaS platforms keep data in proprietary undocumented formats, and usually there is little possibility of extracting it in its entirety for use in other platforms or programs. There are some exceptions, though. Google, for example, has a engineering department (known as the Data Liberation Front) whose singular goal is to make it easy for users to move their data in and out of Google products. We think SaaS offers several advantages over the traditional software model. But we think that the data should be owned by the customer and that he or she should always be able to move his or her data from one provider to another one, without losing detail. SaaS customers should be able to export data into documented formats so that it can be use by other applications and programs. 1. It’s very difficult for one person to manage different aspects of being in business. Being a freelancer means being in business for yourself. And being in business, obliges you to look after mission critical tasks that any business must deal with: production, marketing, sales and administration, to name a few. If you don’t look after all of these areas, parts of your business will invariably suffer. Each business area is usually a job unto itself. E-myth author Michael Gerber reminds freelancers and people starting out owning their own business to work “on” their business instead of working “in” the business. Most professionals that go solo tend to like the production aspect of their work and so other tasks like marketing go undone. That’s a big mistake for obvious reasons. 2. It can get lonely at the top. The first couple of months as the CEO of You, Inc., without your foul-smelling boss and without those annoying colleagues that irked you so much can be great. But as time goes on, most people get lonely. If business slows and you begin to face adversity, this is when you really begin to feel it. It is much easier and better to deal with this adversity as part of a team. By yourself it’s really tough. But as the old saying goes, “when the going gets tough, the tough get going.” But it’s easier said than done. 3. Your business grows in slow motion. Good ideas come more slowly and most projects take longer to complete than if you were working for the man. Why is that? It has a lot to do with team work. When you work with other people, the whole is greater than the sum of the parts. Ideas flow more freely and develop more quickly based on the synergy that is established among members of a team. And obviously the work is gets done more quickly since more people are there to do it. Productivity also is enhanced since people tend to specialize in what they are good at and so the work gets done even more quickly. A seminal work that deal with synergy and team work is Stephen Covey’s Seven Habits of Highly Effective People. 4. You might work more and get paid less than you did at your corporate job. This stems from number three. Since you are doing all of the heavy lifting in your company, and all of the administration and all of the marketing and all of the sales, well, you end up working more. When you average your income per hour worked, that means you get paid less. The worst part is that unless you have a lot of cache, a personal brand and lots of contacts willing to pay you handsomely once you go into business for yourself, it is hard to charge the same rates that would give you a salary equivalent to your corporate job. Your potential clients have to value your services to pay you top dollar and building that brand equity is an uphill battle. 5. You may dislike your clients more than your boss. Most people going into business for themselves have to build their client base from the ground up. One of the difficulties you may find is that you are forced to take projects from low-quality clients, i.e. ones that don’t value your services, don’t pay on time or at all, or simply are difficult to work with. This can be one of the more unsavory aspects of being in business for yourself. And you just can’t fire them because you need the income. So you grin and bear it. If you can deal with these and other drawbacks from being on your own, then perhaps freelancing is the right choice. And there are some jobs or professions that naturally lend themselves to freelancing, such as writing. If you do decide to go for it, make sure you try to establish some strong client relationships before doing so. A good rule of thumb is only to go in business for yourself when they have lots of contacts and one or some of them are going to pay them at least 50 percent of a salary on a monthly basis. If you have those relationships in place, then you might be ready to venture off on your own. Good luck! 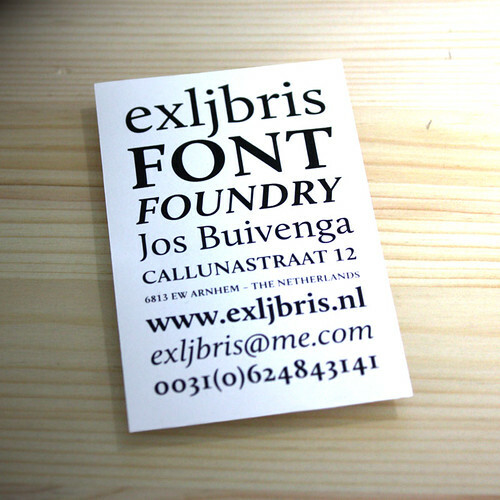 This purely typographic business card belongs to Jos Buivenga, a typographer, owner of exljbris type foundry and creator of the popular Museo family of typefaces. 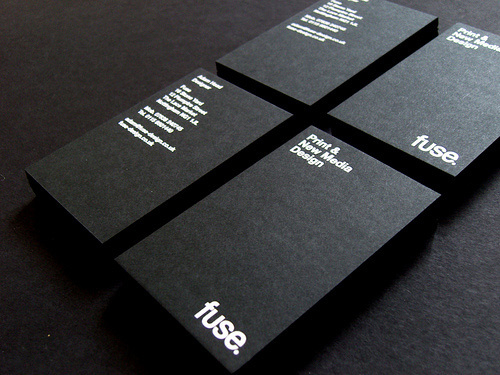 The minimal design allows the “type” to speak for itself and represents the principle business activity of the company. SearchEngineWatch.com is great source of information on online and search engine marketing. An article by Mark Jackson from 2009 makes three points on having a successful Web presence that should be repeated. Most companies worry about getting into the top three positions of Google search results related to their product or service. Most don’t worry about the potential client once they go to Web site, though. Mark likens this to a merchant who cares about “location, location, location” but then doesn’t bother to properly decorate the store or hire well-dressed and courteous sales personnel. 3. Search engine optimization matters. Brand matters: This means that your Web site must reflect the values and personality of your business. And it should inspire trust. This has everything to do with the style and looks of your Web site. The design of your logo and Web site (the typography, the colors, the choice of images like photos or illustration, how well the overall design is executed, etc.) are critical in transmitting the quality of the service or product you sell and the prices you are likely to command. Usability matters: This means that your Web site’s design should be intuitive. Users, clients, and prospects should find it easy to navigate or use. If you and your Web design team have done a good job, your visitors will be using the Web the way you want them to and you will be converting a higher percentage of them to paying clients. This also means that visitors expect to easily find information like your telephone number or support email address. Search engine optimization matters: This means that your Web site should be readily visible in search results for keywords related to your services, products, and location. But how does that happen? One way is by providing relevant content. Blogging is a good way to create quality, unbiased information that visitors find useful, positions you as an authority in your field, and increases the relevance of your content in search engines. But the design and usability of your Web site also matter for SEO. The better the content, the more attractive the design and the easier the site is to use, the more visitors will like and link to your site. And inbound links are key component of the way search engines like Google rank Web sites. These are broad rules to keep in mind to be sure. Keep them in mind when redesigning your start or commissioning a Web site design for the first time. Let me count the ways: black and white business cards are simple, elegant, minimal, beautiful, bold, classic, handsome, etc., etc. A Landor Project, via LogoDesignLove. A New York Times illustration by the Brooklyn-based studio, Rumors. Here are two things that that caught my eye today and are rather inspiring in their own right. I recently saw an article by the owner of a company that sells Website design and marketing services to accountants that offered some sound advice for small business owners and self-employed professionals. Rather than trying to dazzle the visitor with slick images and stock photos of beautiful people being beautiful, try offering the prospect familiar comfortable images. A picture of a local park, maybe, or main street on a sunny day, kids playing outside the public library… If the initial impression on your site is one of comfort, safety, and best of all, recognition your retention of new visitors will go up more than 30%. I have to say that I agree with the basic assertion that the Website should be “friendly” and not try too hard to appear to be something it is not as in the case of using slick stock photos of beautiful people. On the other hand, I disagree that a picture of kids or a local park will lead a client to remember your site. It might help a prospect view you as a local outfit but I doubt it will raise your profile or increase retention. The main problem is that including homemade photos of familiar local places in a willy-nilly manner can quickly cause your Website or marketing collateral to appear amateurish. Friendly is one thing. Unprofessional is another. Now is not the right time to indulge in artistic expression. Graphic design changes can drive your costs right through the roof. Trying to find the perfect shade of blue in a world where every monitor on the planet displays colors differently is not an effective use of your time. There are a lot of much more important things that need doing. The site needs to be nice, yes, but the overall look is really a very small part of the design process. In fact, some very effective and profitable websites are just plain ugly. While it’s important for your site to represent your tastes don’t get stuck on creating the “perfect” look. Even if you succeed it won’t be worth the time and money you just spent. All you will have accomplished is creating a site style that appeals to you. This is one of the most fundamental mistakes in advertising. Advertising should not appeal to the advertiser. What you want is a site style that appeals to your prospects. I like the idea the article expresses of what I’ll call “universality.” That is, your design should appeal to your market, not just to you or to your designer. 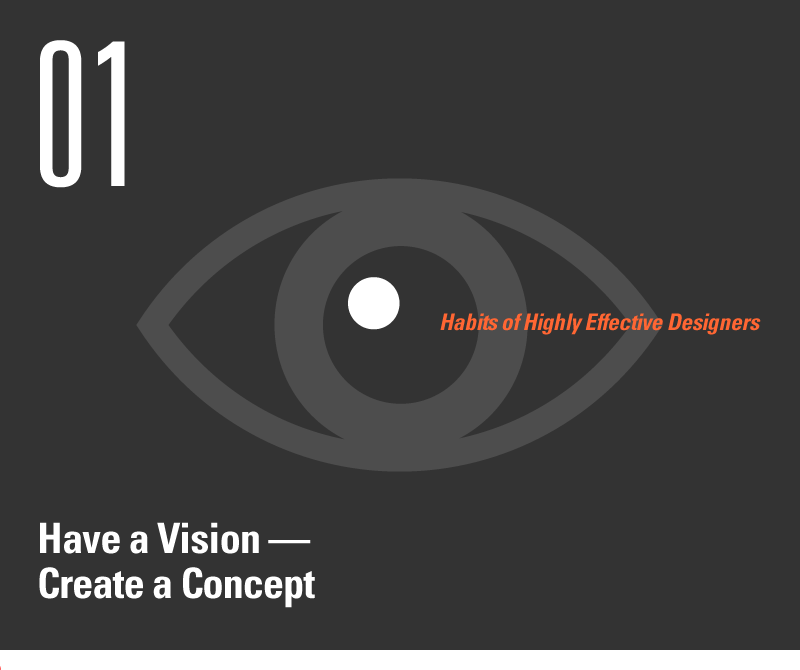 That is an important principle that trained designers learn in design school. I also agree that if you are a small business buying custom graphic design you shouldn’t aim at perfection, at least not initially. Graphic design is a process and as it wears on, the design itself improves. Half the battle is just showing up, something that most people in small business understand. And yes, if you are investing in custom graphic and Web design then asking for multiple iterations of your Website or business card is going to start to cost a small fortune. I do take umbrage, however, in the way the article downplays the importance of aesthetics and that you (or your design supplier) shouldn’t strive for perfection. Aesthetics are important in transmitting your company’s values. In addition, some designs are beautiful, some are just plain ole ugly. Some are in between. Those that are neither here nor there can usually be improved up until the point where the design in question reaches near perfection—in the way the graphics, images and information interact and in the way they obey gestalt principles of design and aesthetics. Maybe as a small business you can’t afford to hire this kind of design if you are buying design as a service and paying an hourly rate. On the other, I think if you are buying pre-formatted or template-drive graphic or Web design then I think those templates should each be pretty near perfect in and of themselves. Maybe perfection is not the right word. “Excellence” may be more appropriate because it allows for the idea of improvement over time, a key value in business. 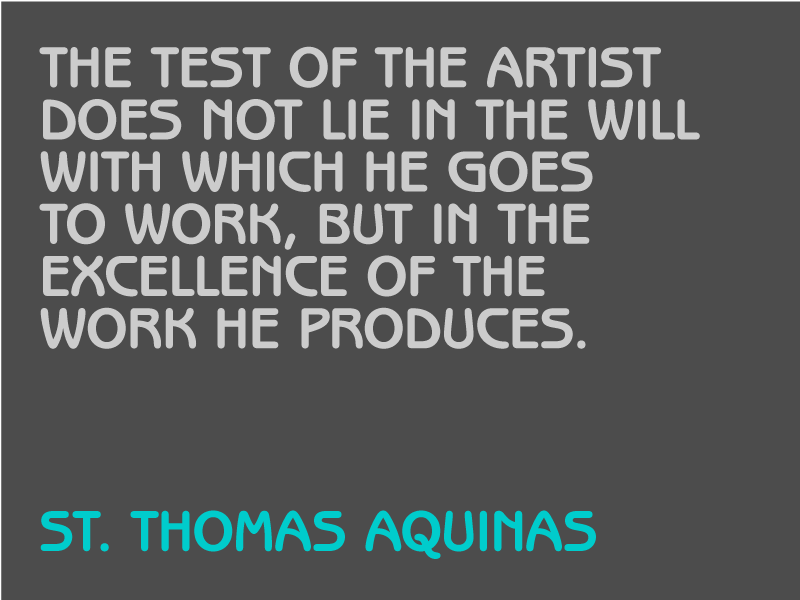 But as St. Thomas notes, I want my artist to be pretty darn good at what he does. Ultimately, if I am a small business I want to buy my business identity and marketing collateral design from a company who really believes in the quality of its designs and doesn’t trivialize its importance in the overall scheme of things. Sure, other aspects of the process are important but if you are buying Web design, then I think you should buy it from someone with a passion for design and his or her own creations.